Strumpet Hayley Gold in the New World War 3 Illustrated! Strumpet Hayley Gold is in the new issue of World War 3 Illustrated! This issue, "Before and After", includes Hayley's brilliant memoir Nervosa, about her hospitalization for anorexia. This is must-read stuff - a wrenching story of a near death experience told with Hayley's trademark interwoven page design and total honesty. Visit World War 3 to buy this new issue - or grab your own copy of the original minicomic of Nervosa, from Hayley's Etsy. Highly recommended! Thanks so much to Mey Rude and Autostraddle for a Drawn to Comics review of Strumpet 3 that made us blush! On behalf of our artists, thanks for spreading the word! "I’m really a fan of what The Strumpet is accomplishing. In a time when DC and Marvel comics each have less than 15% of their artist and writer positions filled by women, it’s extremely refreshing and necessary for a collection of comics like this to exist. 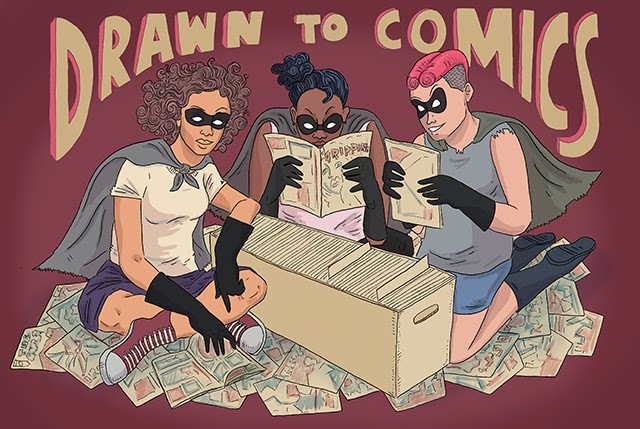 Not only does it give readers a place where we can find creative and talented ladies who make comics, but it also gives those ladies a chance to be published and get their names out there....this is really an excellent collection, and I’m looking forward to purchasing and reading the previous volumes and any future ones that they put out." Well, a Strumpet's work is never done. Believe it or not, we've already got our thinking caps on for issue 4! Dig Strumpet 3? Fancy maybe contributing something yourself next time? "Like" our Facebook page and you'll be up to date on all the submission info as soon as it's announced.